In addition to roasting their own beans, Late for the train has a wide variety of coffee and tea beverages, and food offerings. Which includes locally sourced cookies, pastries and sandwiches. We shared chocolate chip cookies, zucchini bread and a chocolate danish. All were really good. My husband had the COCONINO MOCHA, which is an iced beverage made with their signature cold brew and homemade chocolate sauce. I had a half sweet, iced Black and White with an extra shot of espresso. Both where really good but my favorite was the Black and White. In fact, it was the best one I have had!! 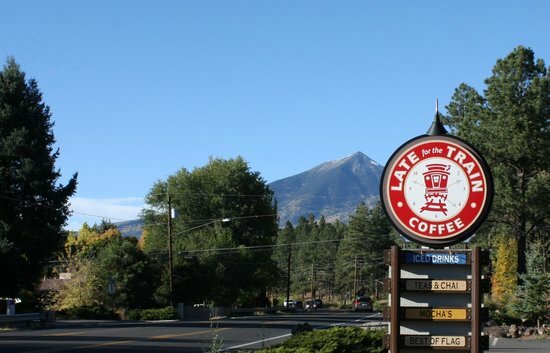 If you are in the area, be sure to give this place a try (www.lateforthetrain.com). It is the perfect midway point from the Grand Canyon to Phoenix. Categories: Uncategorized | Tags: Arizona, AZ, chocolate, chocolate sauce, coffee, coffee beans, coffee house, coffee shop, cookies, espresso, esspressotrips, Flagstaff, Late for the Train, mocha latte | Permalink.